The first streets in Falconbridge were laid out in the mid 1980s. Before that this area was farm fields and woods. The aerial photos below were taken in 1940, 1955 and 1972. Can you find Falconbridge in them? 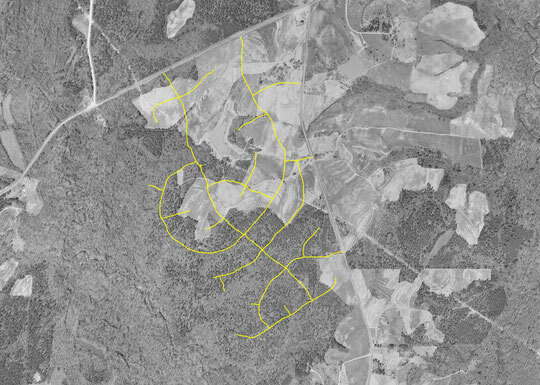 We've created copies of the photos with the streets of Falconbridge overlaid in yellow to help you find your location. Notice that in 1955 the dam looks brand new and the pond wasn't filled yet. Did you know there was a second dam with its own pond in what is now the cul de sac on Charrington Place? The original plan was modified when I-40 was proposed. This shows the revised plan on both sides of I-40. 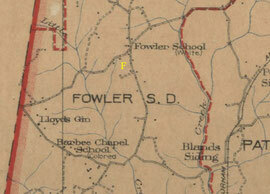 The 1920 county map is full of geographic and social information. At that time the land that would become Falconbridge was part of Patterson Township - probably named after the family which owned the Patterson Mill just north of here on New Hope Creek. We were in the Fowler school district which had two schools: Fowler (for white students) and Barbee Chapel (for colored students). The little black dots along the roads were buildings. Local farmers had their cotton crop "ginned" at Lloyd's Gin on Barbee Chapel Road. Have fun browsing the full size map below.